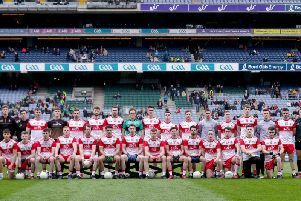 Tyrone’s National League Division One status remains in the balance after they lost out by a single point to Cork on Sunday afternoon in Healy Park. The Red Hands led comfortably on more than one occasion but a disappointing second half allowed the Rebels to claim the two points on offer. This leaves Tyrone in real relegation trouble now, sitting second bottom of the table with a trip to fellow strugglers Donegal and a visit from All Ireland champions Kerry still to come. Mickey Harte will have been disheartened not to have taken something from this encounter, having led by five points with just 15 minutes remaining. Tyrone, however, couldn’t keep up their intensity. Cork introduced fresh legs using all six of their substitutes after 55 minutes, including a triple substitution amongst their forwards at this juncture. This gave Brian Cuthbert’s side the impetus they needed to kick on, hitting seven points without reply. Things began in scintillating fashion for the Red Hands, Connor McAliskey lighting up the Omagh venue with a brilliantly taken goal applying the finishing touches to a smooth counter attack. Having broken down a Cork attack inside the Tyrone defence, the Red Hands broke at pace, Peter Harte picking out the lone forward Connor McAliskey with a sweetly placed kick pass. The Clonoe man showed great composure to step inside his marker and finish powerfully low past Micheal Martin in the Cork goal. Tyrone could well have had a second goal a minute later when, again on the counter-attack, Aidan McCrory’s goalbound effort was blocked out for a 45. Darren McCurry fired the home side four points in front after six minutes when he found himself on the end of another counter-attack, the Edendork forward making no mistake. Cork needed a score after a slow opening couple of minutes and Colm O’Neill provided it with a neatly taken effort. Tyrone and Connor McAliskey struck right back again, doing well to win the ball before slotting an effort over off his left foot. The Rebels weren’t about to roll over however, and they caused Tyrone real problems around the midfield, were they won many of the breaks around the middle on the Tyrone kick-outs. This led directly to three Cork points in consecutive minutes, between the 12th and 14th minutes. Colm O’Driscoll got the first point from play before Mark Collins and Colm O’Neill brought the Cork deficit back to a solitary point. Just as the Rebels looked to be getting on top of Tyrone, they struck the net once again, this time from the penalty spot. The marauding Padraig McNulty was pulled to the ground as he closed in on the Cork goal, Peter Harte cooly converting the spot kick. A minute later, the gap between the sides was five points, Connor McAliskey showing great instincts to turn and shoot between the Gortin Road uprights. While Tyrone’s dominance on the scoreboard probably wasn’t reflective of events on the field, Tyrone’s high intensity game couldn’t be sustained for the entire half as Cork tried to get back into things. Colm O’Neill showed his class with two brilliantly converted free kicks, including an effort from nearly 50 metes. Darren McCurry responded for Tyrone striking a sweet point with the outside of his left foot from 40 metres out. Cork hit back inside a minute as Brian Hurley pointed from a placed ball after a fairly harsh free was blown against Justin McMahon. Tyrone finished the half well though, points from Darren McCurry and Connor McAliskey left them leading by five points at the interval. Colm O’Neill opened the scoring in the second half for Cork but Tyrone’s response was impressive as McCurry added to his side’s tally from a free. Colm O’Neill added a point from a free a minute later and the Rebels might well have hit the net as Paul Kerrigan tried to fist across goal to the waiting Hurley only for Niall Morgan to cut out that chance. A foul on Padraig McNulty in the 46th minute allowed McCurry again to find his range from a free. Donncha O’Connor took advantage of another fairly soft free for Cork but McCurry again replied for Tyrone with a point from play. Then came the triple substitution for Cork and the momentum of the game shifted. Tyrone could well have killed it off but poor finishing, a real weakness in Croke Park a week earlier, again hurt their chances. Points by Donncha O’Connor, Conor Dorman, Fintan Goold and Colm O’Neill left Tyrone leading by just a point and there was only going to be one winner. Goold found himself black carded late on and with all their changes made, Cork couldn’t replace him. Donall Og Hodnett levelled with a fisted point with four minutes remaining before strikes from Brian Hurley and O’Neill left Tyrone adrift. McCurry added a late point from a free, Tyrone chasing the game but unable to get their hands on the ball. A late free kick from Cork sailed wide, but it didn’t matter as Marty Duffy brought the game to a swift close.